5000+ years of history at Cissbury Ring! Just north of the coastal town of Worthing, Cissbury Ring is one of the jewels in the crown of the South Downs National Park. 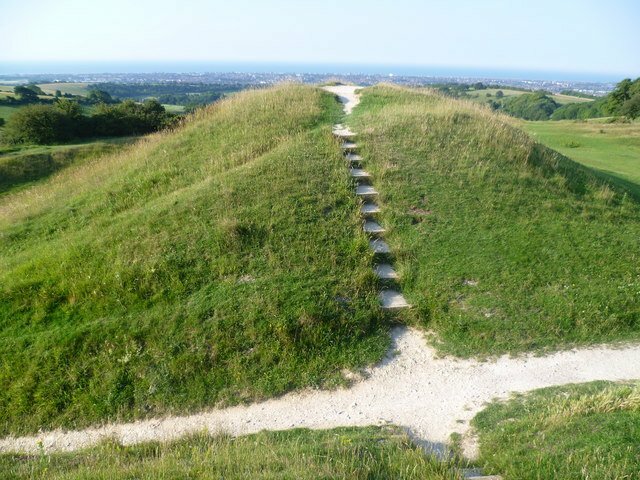 It’s the largest hill fort in Sussex and has a history dating back over 5,000 years. Set high up on a chalk promontory, its ditch and ramparts enclose about sixty-five acres. It dates from around 400 BC and was used for defence for about 300 years. From the top on a clear day you can see forever: Enjoy views across to the chalk cliffs beyond Brighton and as far as the Isle of Wight. Long before the hill fort was constructed, Cissbury had extensive Neolithic flint mines. Miners used antler picks to dig shafts up to fifty feet deep, with several galleries opening out at the bottom. Flint was the common material for making stone axes to fell timber and work with wood during the Neolithic period. Centuries of continuous grazing have produced a marvellous habitat for butterflies and flowers. Rare plants such as the round headed rampion, known as the ‘Pride of Sussex’, thrive here. During spring and autumn you can see a wide variety of migratory birds as Cissbury is one of the first coastal landing points after their long flight across the channel. You can walk to Cissbury from Rosebud Cottage, but friends and I recently drove to Findon then followed a 7 mile circular route. You can find details in the Cicerone walks books at the cottage. Alternatively drive to Findon then leave your car in the small car park at the top of Nepcote Lane and near the base of the Ring.